This spring, Origins was delighted to introduce new townhome collections to the array of exquisite home designs already available. 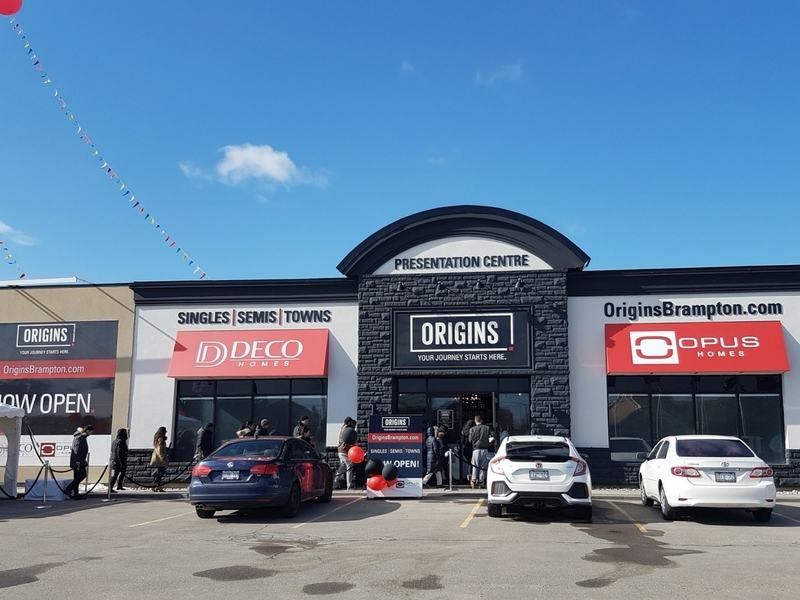 The Origins community has a wide variety of home types, mixed with parkland, a natural corridor and walking trail, proposed school and commercial developments, all situated in a Brampton’s burgeoning north west. Building on the success of recent developments just to the south, that have seen transit expand to include Go Transit at Upper Mount Pleasant, the Origins community will be integrated to the existing vibrant neighbourhoods of Brampton. This area is a short drive to nearby Rec Centres, like Cassie Campbell, public and separate elementary and secondary schools, and large recreational parks such as Gage Park, Loafer’s Lake, and Heart Lake. What distinguishes Origins within the broader context of community, is the outstanding level of detail both indoors and out. OPUS Homes and DECO Homes offer finishes that are anything but standard. Architecturally, our home designs feature more stone, custom precast moulding, colour matched trim, steeper roof pitches, and available dual entry doors or 8’ single panel doors. These homes are incredibly striking from the street, looking more luxurious, using materials that withstand the test of time. Gourmet kitchens with Granite Counters, Undermount Sinks, and Upgraded Faucets, along with Extended Upper Cabinetry. The townhomes at Origins truly must be seen to be appreciated. Available now are Terrace Towns, Dual Entry Towns, and Classic Towns. Terrace Towns are perfect for first-time buyers or young families. They feature gorgeous terraces, perfect for dining outdoors. These homes range in size from 1300 – 1600 sq. ft. and have two and three bedroom options. Our Dual Entry Towns are excellent for families with commuters. These home face onto Chinguacousy, and have direct access to this transit corridor. Another entrance from the rear is ideal for drivers, with a single car garage. Dual Entry Towns range in size 1800 – 2200 sq. ft. and have 3 and 4 bedroom options. Finally, our newest home designs are in our Classic Towns Collection. With a full back yard, these homes offer a more traditional layout and back yard space. The townhome collection offers homes ranging in size from 1500 – 1900 sq. ft. with 3 and 4 bedroom options. In addition to our townhomes, DECO Homes and OPUS Homes is also proud of their beautiful and functional Detached and Semi-Detached homes at Origins, all of which are still available, from $764,990*. * Pricing, finishes and availability is subject to change without notice. See representative for details. Next PostNext Glen Ridge’s Estate Homes In Aurora Construction Takes Shape!